Graylog2 is a powerful and scalable open source log management and data analytics system on top of elasticsearch. Since our logging module is based on log4net, the integration of Graylog2 as log destination is very easy thanks to the available gelf4net adapter. The gelf4net project provides a log4net adapter that formats logs to the GELF specification and makes it easy to send them over UDP or AMQP (but we did not test AMQP yet). Currently there are no TCP or HTTP adapters available. 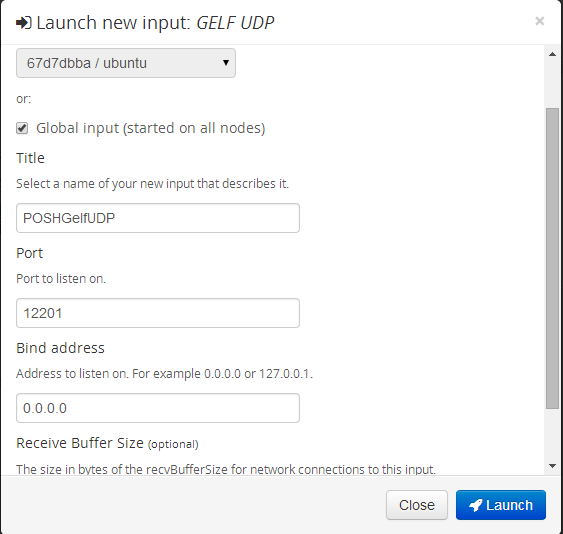 The first step is to create a GELF UDP input listener on a desired port. Otherwise the system will not accept the forwarded messages from the client. Note down the port as you will use it later in you log4net configuration. Here you can also choose whether you want to have the input accepting messages on all nodes (“global”) or you on a single node. The easiest way to install gelf4net is using the nuget command line tool, which also downloads the log4net package. The latest version of the nuget.exe command-line tool is always available from http://nuget.org/nuget.exe. Attempting to resolve dependency 'log4net (≥ 2.0.3)'. You now have to add an appender setting in your existing log4net configuration, where you specify IP address and UDP port number that you configured on the server side. Note how you can also specify additional fields (e.g. “AdditionalField”) in the configuration. Later in Graylog2 these fields appear prefixed with an underscore: “_AdditionaFields”. It is recommended that you -if you have the chance- do the proper formatting before you insert the data in to Graylog2, as you then do not have to do any extraction/rules. When using the d-fens logging module you can split the message into separate fields already so you do not have to do the splitting based on default pipe character (“|”) we are using. One more note about the GELF format: In the specification you can read that specifying the “Facility” is deprecated. You should have this as an additional field as well (in contrast to the above example). As soon as your log messages are in Graylog2 you can do whatever you have to with these messages just as usual. So in case your applications are using log4net anyway you don’t have to use any specific log forwarders but just adjusting your existing log4net configuration – and the best thing is, that all your scripts can now log centrally as well (e.g. when they use the ‘biz.dfch.PS.System.Logging’ module). As a side note: you can also use this to log messages to logstash as they are accepting Gelf as an input as well.